Clear skies, ocean breeze, and exciting times with one you love—all this and more awaits you at The Adventure Boat in Honolulu, HI. This trusted private boat tour is ideal for surfing trips, scenic outings, and night excursions under Hawaiian stars. These professionals are committed to going farther and faster than any other tour group on the waters. This breathtaking boat tour will take you along for a ride out on the sea, where the coastline fades and the sea life is active. You and your guests will enjoy two-and-a-half-hour cruises that can be customized to suit your particular fancy. From snorkeling to sightseeing, these courteous adventurers are dedicated to helping you create lasting memories. Are you tired of long lines and crowds of tourists? 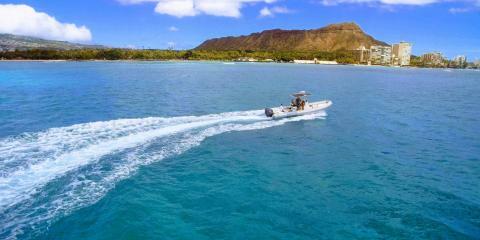 Set sail on this wild boat tour that cruises around the coast of Oahu, featuring Waikiki, Diamond Head, and Koko Head slopes. This private charter can fit up to six, plus the crew, and it never includes other parties. Feel free to ask staff members for special accommodations for added personalization during your escape from the hustle bustle. In addition to daytime and sunset tours, don’t miss out on your chance to see Oahu at night during their Stars and City Lights Night Cruise. Take pictures and breathe in the fresh air as the night sky engulfs the southern bay in a priceless display of beauty. When deciding on how to spend your Hawaiian trip, make sure to add The Adventure Boat to your itinerary. Call them today at (808) 278-7347 to check available dates or visit them online.